1) The article discusses the Land Policy Initiative (LPI) and how relevant activities are planned and implemented to think through and develop strategies and road maps that will culminate into the development of a coherent, unified and cutting edge Capacity Development Framework (CDF). LPI Capacity Development was a sub theme at the Working Week 2013. The LPI was discussed at the GLTN/Director General forum which were spread over 4 sessions during the Working Week and furthermore there was a special session on Africa LPI Capacity Development where Solomon Haile presented the proposed Africa LPI Capacity Development initiative. Capacity development is at the heart of the Land Policy Initiative (LPI). The AU Declaration on Land Issues and Challenges in Africa urges member states to “build adequate human, financial, technical capacities to support land policy development and implementation.” Drawing on the overarching guidance provided in the Declaration, the LPI Strategic Plan and Roadmap provides impetus for action by making capacity development one of its key objectives and aiming at “facilitating capacity development and technical assistance at all levels in support of land policy development and implementation in Africa.” Capacity development also features in other strategic objectives of the LPI Strategic Plan and Roadmap. Knowledge creation/documentation/dissemination as well as advocacy and communication, which form other elements of the Strategic Plan and Roadmap, have significant capacity development overtones. Realizing the significance of Declaration, the LPI Secretariat and its strategic partner, namely, UN-Habitat and the Global Land Tool Network (GLTN) joined hands to plan and implement relevant activities to think through and develop strategies and road maps that will culminate into the development of a coherent, unified and cutting edge Capacity Development Framework (CDF). The goal of the CDF is to provide support to land policy processes and address priority land issues in Africa. The activities undertaken thus far to realize this goal include an expert group meeting, a Writeshop and a pilot good practice training which allowed to begin to engage relevant stakeholders and put in pace the building blocks that will eventually form the CDF. The paper will therefore unpack the major elements of the emerging CDF which is currently under peer review. It will highlight the thinking underpinning the CDF by elaborating the ‘what’, ‘why’, ‘how’, etc of capacity development in the context of land policy processes and priority land issues in Africa. These will provide insight on important attributes of the CDF such as processes of engagement, methodology and its various components including what makes it different from what is out there. Launched in 2006, the Land Policy Initiative (LPI) is a joint programme of unmatched scale and ambition designed by the African Union Commission (AUC), the United Nations Economic Commission for Africa (UNECA) and the African Development Bank (AfDB) to enable land play its vital role in Africa’s transformation which includes robust socio-economic development, peace and security, and environmental sustainability. Between 2006 and 2009, the LPI, which has its Secretariat at the UNECA, developed, through a participatory and inclusive process, the Framework and Guidelines (F&G) on Land Policy in Africa. In April 2009, the AU joint conference of Ministers in charge of Agriculture, Land and Livestock endorsed the F&G. In July 2009, The African Heads of State and Government, at the 13th ordinary session of the Assembly, approved the Declaration on Land Issues and Challenges in Africa, calling for the effective use of the F&G at national and regional levels. In 2010, the LPI received the mandate from the AU to use the F&G in support of national and regional land policy processes, developing and implementing strategies and action plans. The LPI has since developed a five year Strategic Plan and Roadmap which covers nine focus areas including capacity development. These have by and large been political processes that generated unprecedented consensus around a common framework, and have clarified vision, mission and mandate of the LPI. At a more operational level, the LPI has over the last two years conducted a number of activities in support of its capacity development agenda: an initial exploration of capacity needs in the five African regions making these a part of the LPI regional assessments and securing the leadership of Regional Economic Commissions (RECs); preliminary identification of learning centers that it can partner with; the conduct of training events (in Namibia and in Senegal), and; hosting a sensitization forum on the LPI capacity development agenda on the margins of the World Bank Annual Land Conference in Washington DC in April 2012 which generated an overwhelming interest and pledges of support from major international stakeholders. The GLTN has worked with LPI for a number of years and helped the development of the F&G. In 2011, the LPI asked the GLTN and one of its key partners UN-Habitat to specifically lead the design and implementation of the capacity development component of LPI’s Strategic Plan and Roadmap. This was readily accepted not least because of the longstanding and shared interest that the two partners espouse to reform land systems in Africa through land policy processes. Apart from having a network of more than 50 major global players, the GLTN/UN-Habitat have extensive experience in providing technical support to land stakeholders at national and local levels. It has a proven track record of facilitating coordination between and among land institutions and development partners, guiding research and documentation, and producing manuals and training packages on topics deemed relevant to land sector reforms and implementation. Key strengths that the partnership brings to the fore include knowledge of land issues in Africa, a network of notable international actors that enjoy considerable expertise, experience and influence in land matters, a brand new capacity development strategy that has emerged from years of practice, an array of land tools developed through research and pilot testing. The LPI and the GLTN/UN-Habitat collaboration on capacity development first took shape in the Expert Group Meeting (EGM) that took place on the 27-28 June 2012 in Addis Ababa. This was a crucial step in terms of engaging key stakeholders as well as identifying the elements of the then “idea only” CDF. The land and capacity development professionals as well as representatives of various interest groups reviewed the methodology presented to the EGM through a Background Paper and CDF Outline. They also agreed on the key principles and approaches to be considered in the development of a multi-year and multi-phased strategic framework and roadmap that will unleash capacities to formulate, revise and implement land policies and address priority land issues. The deliberations of the EGM refined and strengthened the Background Paper and the CDF Outline. This was followed by a Writeshop in November 2012 in Kenya which assembled together a diverse group of African and international experts from academia, civil society, government, and development partners. The International Institute for Rural Reconstruction (IIRR), an international NGO which pioneered the Writeshop Methodology, provided the logistics and substantive guidance which included producing initial chapters of the CDF by carefully selected lead and collaborating authors, facilitating the public peer review the contributions in a workshop setting, rewriting and critiquing them through iterative processes up until satisfactory versions were produced, editing and compiling the chapters into a coherent and internally consistent document. The product that had been produced by a group of experts through this methodology was released in December 2012 and is now circulated for external peer review. The draft CDF is a work in progress. As such, it will also be subject to a rigorous technical and political validation processes later this year. 2. WHAT IS CAPACITY DEVELOPMENT FOR LAND POLICY IN AFRICA? The simple and straightforward answer provided in the draft CDF to this foundational question is the following and readers will note that this is a highly packed description which goes far and beyond a simple definition. “Capacity development as used in [the Capacity Development Framework] refers to the continual and comprehensive learning and change processes by which African governments, organizations and people identify, strengthen, adapt, create and retain the needed capacity for effective land policy development, implementation and tracking for the resolution of priority land challenges facing the continent. Taking a capacity development approach is an essential and appropriate response to the learning needs and mindset changes required in complex environments, and the vital area of land is no exception. The concept of ‘capacity development’ is an important advance on that of ‘capacity building’. The latter implies starting at a point zero with the use of external expertise. Capacity development, on the other hand, emphasizes the presence and importance of ongoing internal processes in each relevant context. The aim of a capacity development process for land policy in Africa is therefore to support, facilitate, improve and develop processes on a sustained and ongoing basis at continental, regional, national and sub-national levels. This means that land capacity development extends beyond training and development of individuals’ skills and knowledge of land and related matters to include the management of change in land policy and implementation.” Clearly, capacity development in the context of LPI is about enabling land policy processes – land policy development, implementation and progress tracking. Where necessary and appropriate, it is also about overhauling existing land policies that may have proved un-implementable. As well, it is about finding lasting solutions to priority land issues. The priority land issues that the LPI has been grappling with are issues that have emerged from continent-wide assessments. These are also issues whose resolution could jumpstart land reforms through land policies. Another thinking that is embedded in the above description is the need to develop capacities at all levels. This has two dimensions. The first is the well-known and the now ubiquitous “individual, organizational and societal level” dimension. The CDF will facilitate the development of capacities and attainment of positive outcomes at all levels. However, it will adjust its focus based on context specific analysis of needs and opportunities. The second dimension that defines the scope capacity development for land policy is the one that breaks down the operational space into continental, regional, country and local level needs and interventions. Let us zoom in one of these two dimensions and further clarify the scope of capacity development for land policy. In the emerging capacity development thinking, it is said that developing the capacity of individuals (e.g. policy makers, government officials, politicians, academics, technical professors, community leaders, etc.) is likely to produce limited outcomes unless the capacity of organizations (e.g. government departments, NGOs, community based organizations, university departments, consultancy firms, land institutes, etc.) witnesses a commensurate development and change. Of course, there are exceptions to this. There are instances when individuals with power, influence and a network can become powerful change agents upon being sensitized to important public policy issues and solutions through capacity development programs. If and when this happens, there is a strong possibility to unleash the potential of large groups change agents and institutions for reforms. Equally, the outcome of capacity development at the organizational level will remain below par if the overall enabling environment is dysfunctional. Therefore, capacity at societal level, which includes government institutions, ministries and ministerial departments, institutions and organizations, civil society, professional associations, private sector, etc and the rules, laws and policies that regulate the interaction among these actors is vitally important, but not easy to achieve. Land policy processes require work on all these level albeit in varying intensities. Practicing capacity development as a process, not as a stand-alone event. What this means in practice is that longer, more rigorous and probably more costly engagements will be required to make capacity development results. Good land governance compliant: good land governance is the sine qua non of a functioning land system including the policy framework that provides strategic guidance to all laws, regulations, land management and administration functions, processes and procedures. Capacity development that fails to make a dent on weak land governance will not succeed in achieving land policy goals. Promoting innovative, flexible and appropriate tool development: land is one of the sectors where intractable issues require tools or solutions. Capacity development needs to facilitate this process of developing tools through for example action learning. When it is done in a participatory way, tool development itself is capacity development. Capacity development, in the context of LPI, is thus tool development as well and the CDF will facilitate this. Results-based: this kind of approach to capacity development begins and ends with a focus on performance and results. Intervention is justified on the basis of tangible evidence that performance needs to be improved on very specific indicators. When capacity development is result based, it also achieves strategic goals and not specific project outputs. Focusing on good practice training – Training is an important component of the capacity development process and one that is most frequently considered by program designers. However, the draft CDF recognizes it is not a silver bullet that solves all problems. Besides, if it is not well designed, it is likely to fail as has been shown by numerous programs that development partners and mainstream training providers have over the years implemented. Hence, the draft CDF’s adherence to good practice training which is described in section 4 and schematically presented in figure 2. Building on existing and ongoing initiatives – Capacity development for land policy in Africa will capitalize on ongoing initiatives and processes to learn what works and what does not work, to create synergy and maximize coordination and efficiency. This why the draft CDF is taking stock of existing initiatives and partnerships. Combining ‘hard’ and ‘soft’ skills – the emphasis of conventional capacity development on the so-called hard skills is one of the challenges that has plagued the relevance land profession for so long. In conventional formal training settings, land professionals often learn things like land surveying, land law, land economics, valuation, land information management, etc. They don’t get to learn vitally important skills or knowledge related to gender analysis, negotiations, communication, conflict resolution, institutional analysis, community and participatory process, etc. This crooked model is replicated in the practice arena and additional capacity development initiatives of land professionals continue to do the same thing that higher learning institutions do. As a result, land systems struggle with professionals in leadership and operational positions that are good at measurement, assessing and determining property values using complex models, litigation, etc, but do not understand and solve basic problems that communities grapple with. Capacity development in the context of the LPI will make a departure from this and attempt to strike the right balance between hard and soft skills and knowledge by facilitating changes in the way land professionals are trained – both in higher education environment and in-service training settings. Appreciation of culture, diversity, context and existing capacity - Each country, and sometimes areas within countries, has its own values, mores, practices that must be taken into account for capacity development to be appropriate and useful. Cultural issues such as traditional relationships between different groups in society and how they each relate to land are of critical importance. Additionally it is essential to recognize and building on existing capacities as a starting point for any intervention. In fact, this is one of the attributes that distinguishes the thinking underpinning capacity development as opposed to capacity building. Importantly, this means understanding and working with local knowledge, skills and expertise wherever they exist (e.g. communities, governments, academic institutions, civil society organizations, etc.). These are being accorded considerable importance in the emerging CDF, because they contribute to making capacity development home-grown and beneficiary-owned. Benchmarking land services provision: land policy process at operational level aim to cut red tape and rot and usher is high levels of transparency and accountability, efficiency, effectiveness and excellence. Therefore, capacity development within LPI will be about improving the standard of land service delivery taking into account good practices and helping those lagging behind to aim for higher performance metrics. 3. WHY A CAPACITY DEVELOPMENT FRAMEWORK FOR LAND POLICY? In the process of refining the outline and the drafting of the CDF, this was one of the questions that has repeatedly been raised and responded to in many different ways. The one answer that came up quite frequently during engagements with stakeholders is the need to have a unified and comprehensive approach wherein shared principles, methodologies, roles and responsibilities are to be clearly spelled out. It is argued that such a framework will make the goals and methodologies of developing capacities for land policy processes across Africa a shared agenda in much the same way land stakeholders in Africa are making the F&G and the Declaration on Land Issues and Challenges a common strategic frameworks and joint reference points to get the most out of limited resources. The CDF for Land Policy in Africa aims to provide strategic and workable guidance to African member states and other African land sector stakeholders in the design, implementation and progress tracking of land policies at continental, regional and national / local levels. The guidance will include identifying and working on common capacity development themes, processes, principles, approaches, etc that may be needed to meet country or region specific requirements. Like the F&G, the CDF will not impose a one-size-fits-all type of capacity development approaches, principles and activities. The diversity of existing capacities and the differences in capacity needs at different levels across the continent are well recognized and do not allow top-down program design and delivery. Still, there are opportunities, challenges and risks that regions and countries in Africa share with one another which lend themselves to a well-designed comprehensive and unified framework. Finally, if one considers the bigger picture, it is easy to note that this quest for a common and unified framework is also part and parcel of the bigger continental political agenda which aspires to bring people and nations together through harmonization of policies, development of supra-national infrastructure, promotion of trade and investment, etc. If data about land and associated capacity land interventions in Africa were carefully assembled and analyzed, it would be clear for all to see the extent to which these interventions are piecemeal and uncoordinated contributing to the duplication of activities and misuse of precious human and financial resources, The Framework therefore intends to facilitate coordination between and among stakeholders with a view to minimizing duplication and maximizing efficiency. By promoting peer-to-peer exchange, Africans with a unified and shared capacity development vision can learn from and build on each other strengths. On the strength of this coordination, Africans and their development partners can expect to get better value for money. Also, the Framework anticipates facilitating a mechanism whereby novel thinking and innovations in capacity development can easily be identified, adapted and used across Africa. In addition to a lack of well thought-through land policies, there are certain land issues that have emerged as key priorities of most stakeholders in Africa. These are issues that stand in the critical path of realizing the land resources potential of the continent for poverty reduction and economic growth. Addressing these issues within the framework of land policies (please note that land policies are political instruments that can help bring about comprehensive and meaningful reform) could jumpstart dysfunctional land systems in many parts of Africa. This is thus one of the rationales why the LPI needs a comprehensive and unified CDF. During the preparation of the F&G for Land Policy in Africa, the Land Policy Initiative (LPI) conducted five regional assessments – one for each African region – through the Regional Economic Communities (RECs). These included undertaking research, facilitating extensive consultations and conducting validation workshops. It is through these and similar engagements that the LPI has realized that some of the priority issues that need to be mainstreamed in Africa’s land policy thinking include women’s land rights, large scale land based investment, land administration, land conflicts, customary tenure and urban and peri-urban land issues. 4. HOW ARE CAPACITIES TO BE DEVELOPED? The ‘how’ question of capacity development for land policy has two dimensions: methodology and substance on the one hand and modus operandi on the other hand. The latter refers to how different stakeholders are to be engaged and assisted to contribute to the attainment of required capacities in a specific context. It includes things like working with and through partners. In relation to training, for example, identifying and working with regional learning centers is an important strategy. This entails supporting selected training centers to grow in to “centers of excellence” in regard to land policy processes. And they will then become focal points for training in their respective regions including for replicating training rolled out at continental level and expanding outreach. On the methodology front, some of the things that are being considered include action learning, needs assessment, good practice training, etc and the way these link up with priority matters like women land rights, customary tenure for example. Also, the CDF is likely to move land stakeholders in Africa away from training-only capacity development to the one that promotes diversified approaches and tools (training plus or more than training). The other capacity development approaches being suggested include technical assistance, peer-to-peer exchange, coaching and mentoring, experiential learning, and exposure visits. Demand Driven Self-Assessments - The most informative and accurate assessments are by local stakeholders, because they have the most knowledge about the specific areas of need under consideration and are also unlikely to let technical considerations drive the assessment agenda. Starting with Existing Capacity - Identification of existing capacity is the essential prerequisite for understanding what individuals, organizations or sectors need to move forward to the next level or stage of performance. Using a ‘gap analysis’ as the primary assessment tool does not help as the goal is determining capacity gaps between current and desired states of performance and bridging the same. This analysis ignores the capacity that already exists, or the role of important actors like key change agents and previous or current processes on which new intervention should build. Additionally, in the gap analysis approach the definition of required capacity is often too ambitious, based on international standards, rather than achievable next steps relevant to the local context. Local Culture and Context - Analyzing culture and context – at organizational, sector and institutional levels as needed – is the only effective way to ensure that all enabling and constraining factors are taken into account and understood. In particular this means paying attention to cross cutting issues, such as gender, power and the work environment. Assessment tools should be adapted to take account of the fact that the starting point of any intervention might be an urgent need protect the capacity that already exists. ASSESSMENT – This is about understanding what kind of training is needed. It includes identifying the best entry points, the motivation for participation in the training and whether or not a system that supports training participants in their backyard (in their organization or country) exists. The quality of assessments is fundamental to the quality, and therefore the results, of any capacity development initiative. DESIGN - Design is a series of decisions, the quality of which is in direct relation to the quality of the information the designers have from the assessment process about both existing capacity and current change processes as well as the capacity needs of the target group. Additionally, designers need to be clear about the theories of capacity and change they will apply to the design, especially with regard to issues like the transfer of learning. 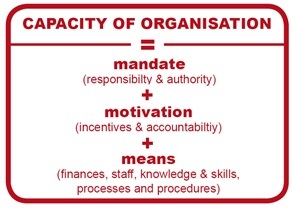 The decisions to be made in the design of capacity development initiatives come as answers to three key questions: Who (group, organization or sector) needs capacity? What do they need the capacity for? How can that capacity best be developed and sustained? DELIVERY PHASE: THE EVENT - Delivery is the stage of the capacity development initiative where the target groups and providers come together. This can take different forms that may be referred to generically as events. Annex 1 gives further guidance on how to ensure high quality and effective delivery; a key point is, of course, targeting the right participants. DELIVERY PHASE: FOLLOW-UP - Follow-up is essential for the transfer of learning. There are many different types of activities that support adequately learning. Managers or others in the workplace can do some of them, while the training providers and the participants themselves can do others. The range includes, but is not limited to the following: workplace coaching session; e-coaching support; peer coaching/support groups; on-the-job training following the external event; individual or group reflections using action learning tools; application assignments with expert support available for problem solving; return workshops for the exchange of experience and learning from implementation; and, small grants to support implementation of activities. The important point to reiterate is that these activities must be considered as an integral part of delivery, rather than as an optional add-on. MONITORING AND EVALUATION - While ways to define and measure development results are generally clear, there are many different ideas about how to define and measure capacity results within specific contexts. Many land systems are multi-dimensional, multi-level and multi-sectoral and capacity development is a long-term process tied to a political agenda, without a predictable, linear path. Although assessing results can be complex and based on qualitative observations rather than measurable indicators, it is nevertheless crucial to monitor the results of capacity development processes, both for improving the design of future processes and to adequately plan the following steps of the ongoing processes. LEARNING MATERIALS - An important aspect of the good practice training is the development of specific training and learning materials and the adaptation – in terms of language, culture, levels of complexity, case studies, etc. - of existing learning materials to the specific audience. At times, training design adopts the ‘training of trainers’ approach. This generally entails that a specific group of participants are undergoing an additional learning process that is expected to enable them to be ‘trainers’ in future learning initiatives. A key consideration that the draft CDF is upholding in this regard is that when designing a ‘training of trainers’ program, it is important to carefully select participants by keeping in mind their capacity development responsibility in their current assignments and roles. Importantly, the support systems they have to replicate training and the extent to which this support system is amenable to change are also crucial considerations. Formal education is arguably one of the most important ways of developing capacities for the land sector. It includes education programmes and institutions that provide training and capacity development at certificate, diploma, under-graduate and post-graduate degree levels. A capacity needs assessment for land surveyors carried out in Francophone Africa8) captured some of the gaps and needs for improvement in the education of surveyors in the region. Similar findings came out of another research entitled ‘Human9) Capacity Needs Assessment and Training Program Development for the Land Sector in in Kenya’.10) In summary, it can be said that a large number of technical education programmes in Africa are old fashioned, structured around colonial models more fit to respond to the land sector needs of 20th century Europe rather than the 21st century fast-changing and rapidly urbanizing Africa. Too few technical schools train small numbers of professionals at high cost. This is one of the reasons for the ongoing shortage of key professionals apart from being unsustainable. The knowledge imparted often focuses on ‘hard’ skills only, while much needed ‘soft’ skills are neglected. It serves more the interest of conventional land administration practices that have proven to be too rigid and costly to service contemporary Africa. As a consequence, this produces professionals who are poorly equipped to face the reality of land challenges, but to entrench outdated, expensive and elitist thinking. It hardly empowers to be creative and devise affordable, flexible, pro-poor, gender responsive and context specific home-grown land administration solutions. There is therefore a need for a more innovative approach to capacity development in the technical disciplines of the land profession. Africa needs to have a larger pool of land professionals with different levels of skills that can better respond to challenges on the ground. It needs professionals whose knowledge and skills sets meet requirements of its people. This does not always mean highly trained university graduates. In some contexts, this could mean creating a large cadre of paralegals and ‘barefoot’ surveyors. In other contexts, this could mean people with specialized knowledge of conveyancing, valuation, etc. A great deal of capacity issues in many land offices could be met through technical and vocational education and training. The CDF needs to inculcate this kind of mind sets through its engagements with land training providers. Also, the capacity of land practitioners, such as traditional and informal land managers, community and grassroots members, should be developed. New land administration tools, techniques and technologies have to be incorporated into the learning processes. The approach the CDF is likely to espouse will aim to change the way land training is delivered on the continent and hope to “catch” the future leaders and land professionals “young”, i.e. before conventional systems corrupt their minds. 5. WHOSE CAPACITIES? AND BY WHOM? In Africa, as is the case elsewhere in the world, the diversity of land sector actors is immense and each represents different roles, interests, capabilities and motivations. Each actor can assume different roles at the different stages of land policy processes (e.g. development, implementation, and monitoring). The above framework, seemingly simple and straightforward, can become complicated when a specific agenda that is relevant for a particular context is identified and stakeholders want to action it. Still, there are tools to analyze who does what. For the purpose of this paper, the most important thing to note is that identifying roles and responsibilities of various actors is as important as having cutting edge tools and methodologies. The paper has thus far tried to shed some light on issues and themes underpinning the capacity development thinking within the LPI framework. It has also highlighted the direction that the emerging CDF is taking. The draft CDF is still very much a work in progress. Therefore, it has not been possible to fully share what is in the draft CDF. However, the material that has been presented in this paper is more than adequate to share information, to solicit views and feedback that will strengthen the CDF, and thereby help all those interested in the agenda to contribute to the LPI vision, mission and mandate. As a way forward, it may be useful to take up a couple of themes which the paper has alluded to, but has not fairly well dwelt on. The first is partnership. Developing the capacity of African land sector stakeholders to implement the Declaration on Land Issues and Challenges in Africa and the F&G on Land Policy is a goal that requires the joint effort of a large number of partners. The draft CDF recognizes that a well-structured collaboration based on shared values, complementarity, comparative advantage, is vitally important and must be actively sought, strengthened and expanded. The CDF will promote this and it is hoped that relevant actors on the continent will embrace the CDF to leverage capacity development resources to create low-cost, high-value programs. The collaboration can include harmonizing and integrating capacity development opportunities offered by existing initiatives, programs, institutions and platforms. Obviously, such collaboration can only enhance coherence among various initiatives and the relevance and credibility of all those involved. Linkages among different land initiatives, including capacity development activities is in the best interest of all actors as it enables them to avoid conflicting messages and overlaps and waste in scarce financial and human resources. The CDF can, when completed, be a platform that provides opportunities to promote the coming together of all actors to maximize relevance and results. The extent to which partners will be committed to work together under the emerging CDF will determine whether or not these goals will be achieved. The second is about resources. Africa counts on a range of partners to support the implementation of the CDF. Continental and regional bodies, national and local authorities, national and international NGOs, training and research institutions, traditional leaders, community-based organizations, professional associations, private sector, and bilateral and multilateral development partners have all an important role to play and are called upon to embrace the LPI and its CDF in this spirit. Land policy development is a lengthy process. It is therefore not cheap. As well, it should not be done ‘on the cheap’ especially if this means compromising inclusiveness and consultative processes. Land policy implementation is even more costly. These costs should be assessed well in advance in the policy reform and design stage. The same could be said about capacity development for land policy. Resources to jumpstart and sustain it should be estimated and catered for early in the process to ensure a degree of preparedness and prevent capacity constraints from standing in the way of policy development and implementation. In regard to resource allocation, international development partners have a significant role to play. But, external funding alone cannot and should not fully cater for this. African governments should be prepared to be a primary source of funding and finance land policy processes and the attendant capacity development activities. 2) The paper draws from the CDF Background Paper and the draft CDF. These are duly acknowledged where appropriate. 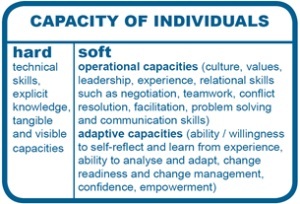 9) The term human capacity is used in this assessment to make a distinction between what people in organizations require and what those organizations require in terms of hardware, facilities, etc. 10) Unpublished Report on ‘Human Capacity Development Needs Assessment and Training Programme for the Land Sector in Kenya’ . AUC/AFDB/UNECA, 2009, ‘Framework and Guidelines on Land Policy in Africa’, Addis Ababa, Ethiopia. AUC, 2009, Declaration on Land Issues and Challenges in Africa. Global Land Tool Network (GLTN), 2012, Draft Capacity Development Strategy, unpublished internal Document. Government of Kenya, Sida-Kenya, UN-Habitat, 2011, ‘Human Capacity Development Needs Assessment and Training Programme for the Land Sector in Kenya’, Unpublished Repprt, produced by Peter M. Ngau, Jasper N. Mwenda, and Michael Mattingly, Nairobi, Kenya, Coordinated by Solomon Abebe Haile. OECD, 2006, “The Challenge of Capacity Development: Working Towards Good Practice”, DAC Guidelines and Reference Series, OECD, Paris. ‘Séminaire d’évaluation des besoins en formation des géomètres en Afrique subsaharienne; synthèse des réponses, propositions et conclusions’, GLTN, UN-Habitat, FIG, et Organisation Internationale de la Francophonie, 2010.